Images are freedom and words are prison. 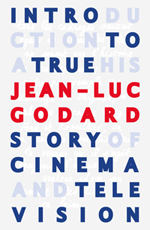 Godard’s lectures and discussions in Montreal in 1978—a series of fourteen meetings that pave the way for the eight chapters of his Histoire(s) du cinema (1988–1998). Translated by Timothy Barnard. Caboose. La « partition » des Histoire(s) du cinéma de Jean-Luc Godard created by Celine Scemama. In the first sample page 1 of the partition makes it immediately obvious what the partition is, and how useful it can be as a follow-up on a viewing [or two] of Histoire[s]. It’s in French, but if you’ve had to watch Histoire[s] only partially understanding the French, this is blessed relief.